Castle Finn seen beached in Ganges Harbour in January, before two fires on Jan. 30 and March 12 reduced the vessel to not much more than its cement hull. The Gulf Islands is a confirmed hotspot for dumping wrecked and unwanted boats, but new federal legislation could make a significant impact toward clearing coastal waters. Bill C64, or the Wrecked, Abandoned or Hazardous Vessels Act, received royal assent on Feb. 28 and is expected to become law this summer. It recognizes the responsibility and liability of owners for their vessels and gives Fisheries and Oceans Canada and Transport Canada wide powers to act when that responsibility is neglected. 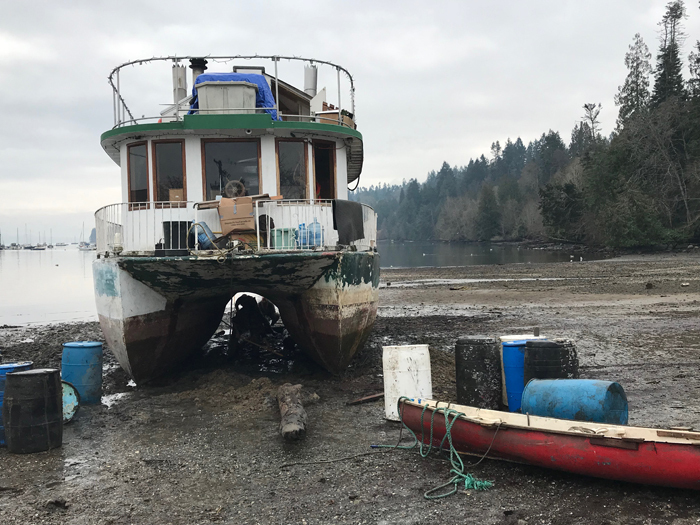 Susan Pickrell, the Coast Guard’s superintendent of vessels of concern for the western region, said it’s not just a perception that Salt Spring and other nearby islands have more than their fair share of abandoned boats. Pickrell noted that many boats in the area have already been cleaned up by the Dead Boats Society and other groups taking advantage of federal funding under the five-year Oceans Protection Plan. However, she also observed that Ganges Harbour had three new wrecks this week compared to just the week before. One of the most visible examples of derelict boats in Ganges is the twin-keeled Castle Finn, which ran aground last November and hasn’t moved since despite a massive community effort in the winter. Two fires have since reduced the ship to its hull, but the boat remains stuck on the foreshore. Contrary to information given out by the Castle Finn’s owner, the Ganges Coast Guard did not assist in bringing the boat to shore and did not grant permission for it to be there. “The Coast Guard would not have the authority to grant permission for this person to beach her vessel,” Pickrell said. In this case the Coast Guard removed the hydrocarbons when the vessel first got into trouble. (Anything left over burned off during the fires.) As the boat was not deemed to be a hazard to navigation under Transport Canada regulations, that ended federal jurisdiction. The Coast Guard has been keeping tabs on the situation and working with the provincial Ministry of Forests, Lands, Natural Resource Operations and Rural Development. Pickrell said the Castle Finn will be a great example of a test case when Bill C64 does pass. The legislation gives officers a wide list of situations under which action can be taken, and the power to serve the owner with a deadline. Noncompliance could amount to a heavy fine — up to $5,000 per day. The large amount is meant to be an incentive for boat owners to take the appropriate action rather than just accepting a fine. What a waste… I would have loved to own a boat like castle finn. It’s a shame there isn’t some form of boat adoption society…perhaps with these fines there might well be? Get a free boat to save, and owners don’t pay fines? win-win. What would be the situation when the owners do not have any money. No fines can be paid.